Other then the dry lemon raspberry loaf slices at Starbucks, does anyone eat quick breads anymore? I think that we don’t eat them, because nobody makes them, too much work? I know, not as convenient as individual narcissistic* muffins or cupcakes, and it is a work out uses a bread knife to hack off a slice of banana loaf…But like all other things that we eat, making it at home is so much better for you then buying the same thing on the run. Ever notice how each Starbucks location sells the same baked goods? How do they do it? Where is the secret Starbucks bakery? Are the cookies, scones and muffins frozen and the defrosted and how do they keep all of that stuff looking fresh? Too many questions, save your money, bake your own. 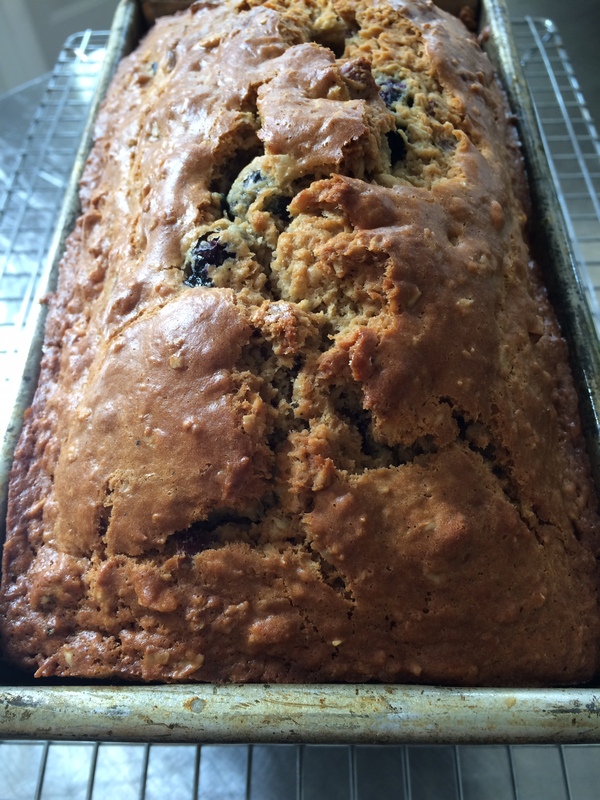 This blueberry loaf from Summer Berries,( pub.1980) by Elizabeth Baird is so worth making, dense and delicious and not sweet at all, it’s delicious for breakfast but equally as delicious with cheese, pickled vegetables and chutney for a picnic lunch. Do people still picnic? It’s important to dredge the berries to spread them evenly through this moist, mildly aromatic loaf. Break eggs into a medium-large bowl. Beat until frothy with the buttermilk, vanilla, and butter. Stir in the brown sugar and rolled oats. Set aside while preparing the rest of the batter. Sift together, into a large bowl, the flour, baking powder, soda, salt, and spices. Sprinkle 2 Tbsp. (25ml) of this mixture over the berries and nuts; toss lightly. Pour the buttermilk mixture over the sifted dry ingredients. Using a fork, mix lightly and quickly, then blend in dredged fruit and nuts. Spread evenly in the loaf tin and bake for 1 hour, or until a skewer inserted in the middle comes out clean. Cool in the pan 10 minutes; turn out onto a rack to finish cooling. Wrap well and store in an airtight container for a day before slicing. *To me, any food that is a single serving, on the run food is narcissistic and isolating, much like head phones in public. We no longer need to share our food or talk to each other. ** Published in 1980 at the height of Canada’s metric conversion the book includes metric equivalents for all recipes. ← Bavarians, a forgotten food.